Planning a visit to Lake Sebu this T'nalak Festival month of July? Then, we highly recommended for you to stay at Punta Isla Lake Resort - the no.1 resort in Lake Sebu, South Cotabato and avail of their T'NALAK PROMO! 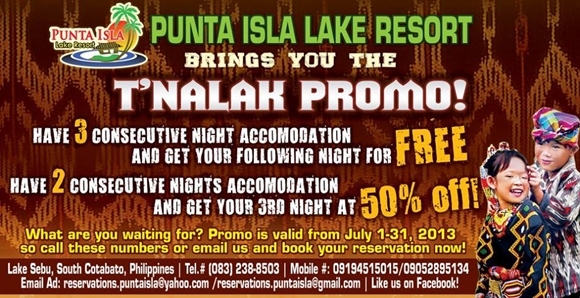 Valid this July 2013, have a two (2) consecutive nights accommodation at Punta Isla Lake Resort and your 3rd overnight stay will be at 50% OFF! Or have a three (3) consecutive nights accommodation and your following night is for FREE! All these and more only at Punta Isla Lake Resort because you deserve to experience more of the bests in South Cotabato.